With today’s hectic lifestyle, not every family is able to sit down together for a regular evening meal, especially during the work week. Kitchen designers are accommodating this fast paced life by creating a “kitchen within a kitchen” for the preparation of quicker, lighter meals. This might include a cluster consisting of prep counter, small refrigerator, clean up sink, and microwave oven – all within easy reach. The rest of the kitchen remains available for preparing larger meals, with full oven and range, full-size refrigerator, and oversize sink for clean up. While traditional wood cabinets remain very popular, some homeowners are remodeling their kitchens with more daring and unusual storage solutions. This includes exotic woods and hardware, plenty of glass, and colorful finishes. Rather than white or stained wood, cabinets are painted in rich colors or dark finishes to complement new appliances and flooring options. In addition, customers are adding more display areas into upper cabinets, selecting glass inserts for door fronts and gallery lighting inside the cabinets to show off their best china or collections of glassware. 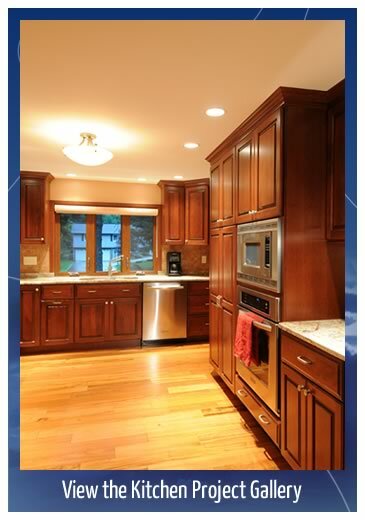 Walk into most kitchens built in the past 30 years and you’ll see a bank of cabinets that are of equal height. But modern designers are breaking up this “solid wall” by mixing in extra tall cabinets (some run floor to ceiling!) with shorter storage areas. Counters are also coming in at different levels. With more open floor designs, counters are being wrapped around at a higher level to create a break between the kitchen and the rest of the house. In other areas, counters are being lowered to create a more convenient workspace for baking and food preparation. Mom used to keep her recipes, unread mail, and address book in a corner of the kitchen, perhaps on the counter or a small desk. Now her recipes and addresses are on a laptop computer, and kitchen designers are accommodating this technological change. Kitchens are being wired with additional electrical outlets and cable access for television and web surfing. Countertops are morphing into workspaces for paying bills and catching up on correspondence right in the kitchen. Function is everything in a modern kitchen. Cabinet manufacturers have responded with innovative designs that allow easy access to the deep recesses of the cabinet, with slide out shelving and racks. Appliance manufacturers are on board, too, with features such as built-in warming drawers, countertop grills and dual ovens. G.M. Roth NH area kitchen remodeling designers have been quick to adapt their ideas to meet the needs of the modern lifestyle. As a result, the kitchen has become an even more important room that is both functional and spacious, and the hub of the home. Let our team deliver your dream kitchen! Call G.M. Roth Design Remodeling today at (603) 880-3761 to schedule a complimentary in-home consultation with one of our talented designers. For kitchen remodeling in NH, you can’t go wrong with G.M. Roth Design Remodeling!